Russia's metal stalwarts ARIA celebrated their 30 anniversary with two gigantic live events on November 28 and 29, 2015 in Moscow. Both events were released on DVD/CD packages in November 2016, so a review is more than overdue. The actual concert marking ARIA's 30th anniversary, aptly called “Ariafest”, took place on November 28, 2015 and is out on a neatly designed double DVD/double CD hardcover digipack. The camera work, the picture and sound quality of 30 Years! Anniversary Concert are impeccable and capture the incredibly lively and energetic atmosphere of the event showcasting a brilliant performance of altogether 24 songs spanning ARIA's twelve studio albums. The songs – classic melodic metal with Russian lyrics – range from the opening title track of their last album Through All Times – a kick-in-the teeth up-tempo number with galloping grooves, twin guitars and soaring vocals that never seem to get old – to the immortal "Street Of Roses". 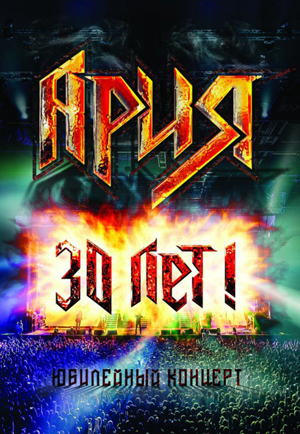 The absolute highlight is when the members of the current line-up of the band, Mikhail Zhitnyakov (vocals), Vladimir Holstinin (guitar), Sergey Popov (guitar), Vitaly Dubinin (bass) and Maxim Udalov (drums) are joined by former ARIA members Alik Granovsky (bass), Aleksandr Maniakin (drums), Sergey Mavrin (guitar), Sergey Terentyev (guitar) and Valery Kipelov (vocals) for a performance of five classics such as “Torero” from their 1985 debut album. My personal favourite is “Follow Me” – a stunning performance of a powerful ultra-melodic heavy metal anthem with vocals that go through the ceiling. The other DVD/CD pack, Classical Aria, features the show that took place on November 29, 2015. Here, classic ARIA songs literally turned classical and very impressive so: the band performed together with the Globalis Symphony Orchestra, conducted by Swedish maestro Ulf Wadenbrandt, who has now been touring with ARIA and various symphony orchestras across Russia sinnce February 22. There are three shows left on this tour and if you fancy a trip to Russia to see them, be quick. Most of the shows have been sold out. Anyway, back to the DVD. After a seven-minute prelude – with the fans boisterously singing along – the band and the orchestra embark on journey through the highlights of the band's catalogue. As before, the quality of the production is amazing and so is the musical performance. The orchestra arrangements add another sonic dimension and a lot of depth to ARIA's songs and it is a lot of fun to watch Ulf Wadenbrandt, who does not resemble a typical conductor but rather a sixth member of the band, steering the full symphony orchestra through the sometimes rough seas of ARIA's classic heavy metal music. Everybody in the orchestra and the band is definitely enjoying themselves and that atmosphere is infectious. Both hardcover digipacks contain booklets with photos of the musicians at work. They are not only a must-have for ARIA fans but also highly recommended to everybody who wants to risk a look – and listen – outside the box. 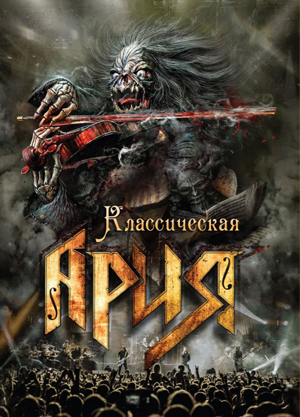 The DVDs can be ordered through the band's official website www.aria.ru. You might need to use an online translator because the website is entirely in Russian. For more information, follow the band on Facebook: www.facebook.com/AriaRussiaOfficial.